Sometimes a very simple instant noodles can be enhanced by just adding some ingredients and it will turn out to match a restaurant or fast food served ramen. Sometime ago I tried to eat in a well known Japanese fastfood serving ramen as their specialty. It is quite expensive and I really though that it must be very tasty having that price on just bowl of ramen. But I was really disappointed and just ate it even though it taste like urine. I just added some sesame oil to mask the unpleasant taste. With a little research I’ve known that some hand made egg noodles does have an ammonia taste and maybe those who are ramen fans like that kind of taste. But I don’t know, I’ve also tried to eat in a Japanese restaurant years ago and the ramen is really good without the ammonia taste. 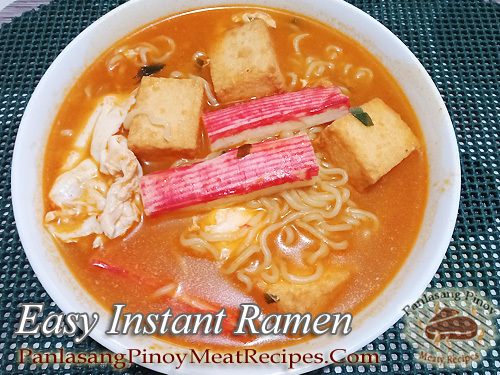 Anyway, the instant ramen doesn’t have an ammonia taste and I’m sure you are going to love this recipe I have here. After buying the instant ramen pack, just go to the frozen sections of big supermarkets and look for the lobster balls, fish tofu and crab sticks and you are ready to go! Put water in a pot and bring to a boil. Open a pack of instant ramen noodles and put the noodles first in the boiling water. Then open the dried veggies pack and the flavoring pack then add it in the boiling ramen noodles. Put the shrimps first on the pot so it will have enough time to cook. After a minute of boiling, add in the lobster balls, fish tofu and crack the raw egg if you want to use raw egg. If you will use hard boiled egg, skip this step. Let it cook for again for another 2 to 3 minutes but don't over cook. Then add the crab stick and stir gently and turn off heat. The reason why put the crab stick last is because it will break in pieces if cooked too long. Transfer to a serving bowl and garnish with sliced hard boiled eggs and some spring onions. Serve hot. This is very Good and easy recipe. Any one can cook any time.